Just saw this message on a Taskalfa 8002i. The firmware is current. Anyone else. The staples were empty. Maybe a firmware bug? I've seen piles of staples in those finishers. Maybe the machine knows more than the engineer? I'm wondering...Do you have a hole punch unit? If you do and you change the word punch to staple , it would make sense. Perhaps the firmware got the words transposed. I have confirmed this issue on 2 other 8002. Both had latest firmware. Looks like a bug. I have it also on 2 7002i's with DF7110. Hotline wasn't helpful. Ordering staple unit and finisher control pwb. I wouldn't replace anything. It's definitely firmware. Just updated a 6002 and it did not have this issue. 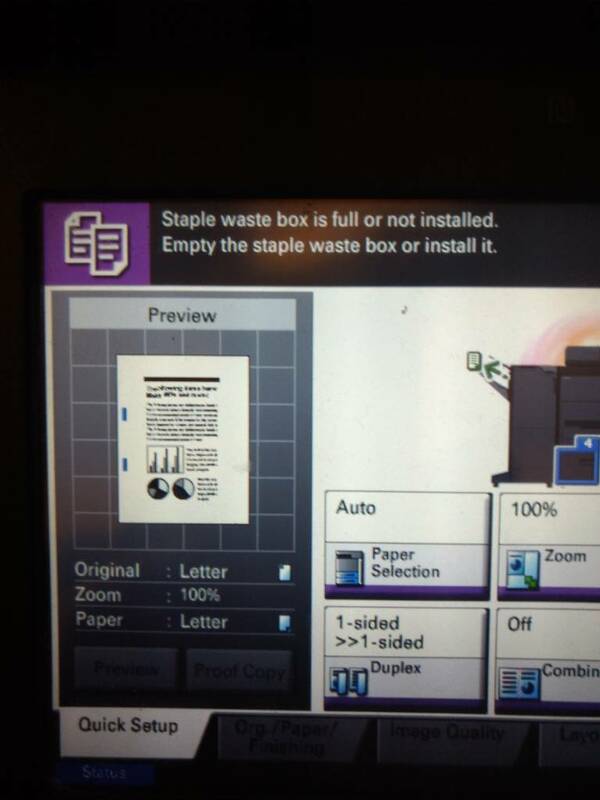 Reported to my Kyocera rep.
Might a punch hole be caught under the punch unit(optical sensor facing down toward hole waste container) and typo in firmware saying staple? Had the same problem when a new 8002i ran out of staples, customer replaced staples and waste staple box full appeared, downgraded firmware and message disappears, definitely a bug in the latest version of firmware ver.4.03.0030. Fixed both machines with the message by also downgrading firmware. Have 1 stapler that is bad however, now doesn't recognize staple present. Awaiting replacement.